Ok...so i know holographic nail polish is old news! But, i was quite slow finding out about them so i thought there MUST be others like me who have only just heard of them or haven't yet, maybe? I love this, every time i look at it i can't believe they can make a colour that actually looks like a hologram, it's crazy! In the right light it looks so beautiful, in dull lighting it does just look dull and grey. You can see how pretty it looks with the flash. These are so cheap to (if you can get hold of them! I have been told they are sold out everywhere). I think they are only £4.50 or so. You need to wear about 3 coats to get a good coverage as it does tend to spread and become uneven. It drys very quickly though which is great. I am hooked on them, i think they are truly amazing! Have you tried any of the other holographic polishes by other brands? What are your thoughts? oooh! i'ce never heard of these either! it look amazingly pretty! i loove holographics. these seem more holographic than china glaze/opi! what other colours are there? I have not tried any of the polishes yet,but omg I will go on a hunt to find them...I love the polish it is so different.. I'm your new follower and new to blogging sooo please follow me...and subscribe to my youtube channel.. Thanks A Million Doll..
is it the same in pics && in person ??? Ooh, I hope I can get this. It is so glitzy. I don't think, I have ever seen polish like this. Gorgeous! You post such great finds, keep it up :-) I have blogrolled you and mentioned you in a Share The Love post. OMG , Wauw that's amazing the silver color, so in love with it! I have to have it! I live in the USA...I should start conspiring immediately. That is the coolest "color"! 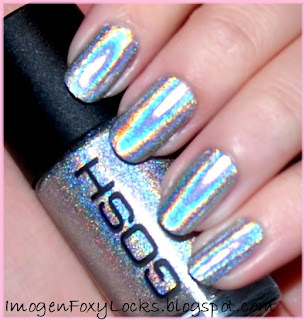 Can anyone tell me where I can purchase GOSH Holographic nail polish? I can't find it anywhere. Thanks! ^ I got mine today in Superdrug -absolutely love it!